Local PPG around Fisantekraal Airfield and Durbanville area. Fisantekraal Airfield in the Durbanville area now has a special radio frequency of 131.1MHz, call "Fisantekraal Traffic". When approaching within 5NM of Fistantekraal Airfield, make a broadcast call on Fisantekraal frequency 131.1MHz even if you are not routing to the airfield - advise traffic at Fisantekraal of your presence, your altitude and your intended route. Wait for any response. If no response (or after responding), you may return to 124.8MHz only if more than 2.5NM out, otherwise remain on 131.1MHz. Be extremely cautious when crossing the extended center-line of runways 05-23 within 5NM of the airfield, advise 131.1MHZ before, during and after crossing the extended center-line. Keep a sharp visual watch (and radio watch) for traffic on final approach and traffic taking off from Fisantekraal when near the extended center-line. All traffic within 2.5 Nautical Miles (NM) of Fisantekraal Airfield must remain in 131.1MHz and observe standard radio procedures and standard traffic-separation protocols. When launching from Goedverwacht Airfield, Grootfontein Airfield or anywhere near the boundary of 2.5NM radius and intending to route outward, first make a call on Fisantekraal 131.1MHz (before lift-off) announcing your intensions and maximim altitude until you exit the area. e.g. "Fisantekraal traffic, motorised paraglider Alpha-Bravo-Charley, about to lift off from Goedverwacht Airfield, will be routing to the North below 1000ft. Any traffic?" After listening for a response, do the same on 124.8MHz, then proceed with launching. Take note: Cape Town's CTR starts approx 2.6NM South West of Fisantekraal Airfield. Make sure you know where controlled airspace starts, do NOT stray into the CTR! 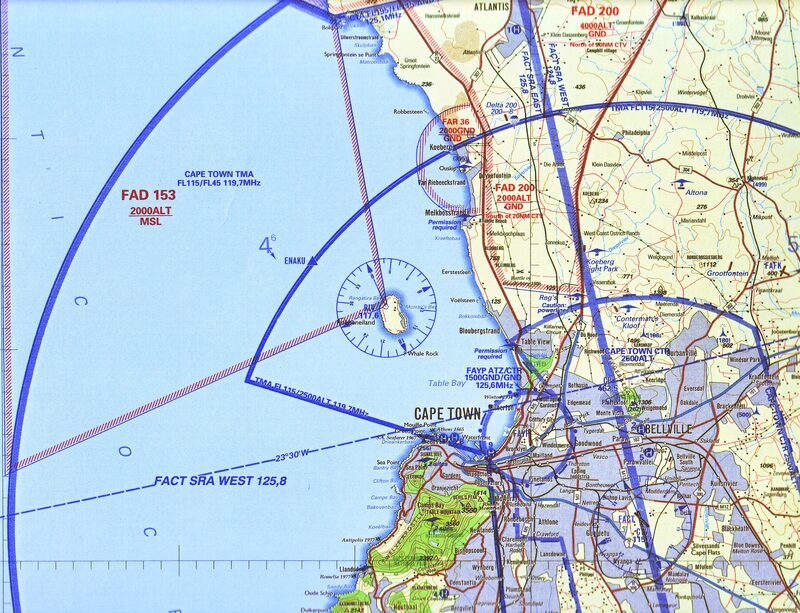 You should have a copy of the 1 : 250 000 scale VFR chart of Cape Town. Download a small portion of the VFR chart here (2.4MB) (right-click, then click SAVE AS). 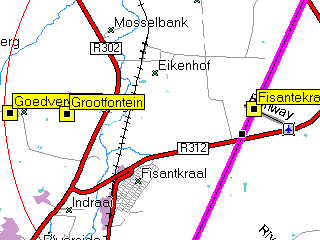 It is highly recommended that you mark Fisantekraal on your GPS, set the GPS on GO TO Fisantekraal in order to be aware of your distance from the airfield. In case yor GPS is set to Metric units, 5NM = 9.26km while 2.5NM = 4.63km. Click on the small map to view a larger map of the area (or Right-click, then SAVE LINK AS, or SAVE TARGET AS). 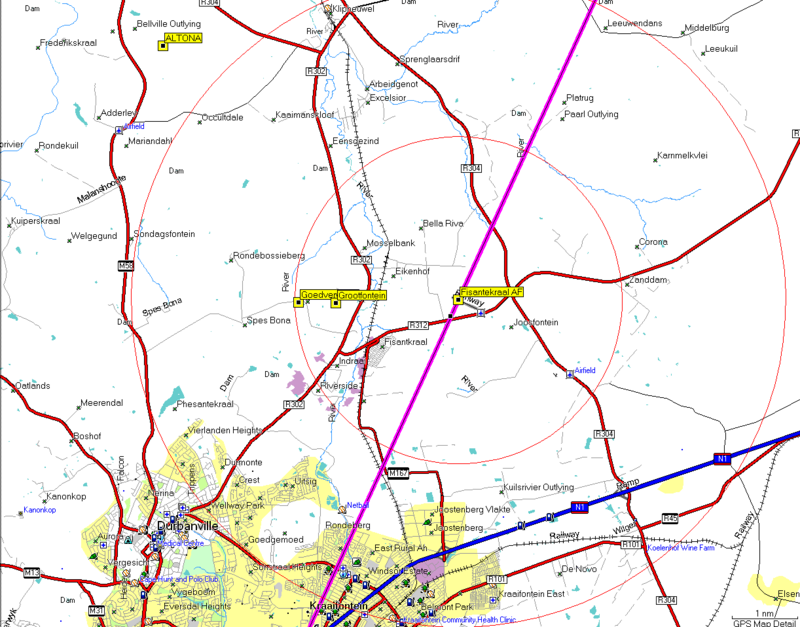 The Purple line represents the extended center-line of Fisantekraal's runways 05-23. .
Read also the procedures for Goedverwacht Airfield here!